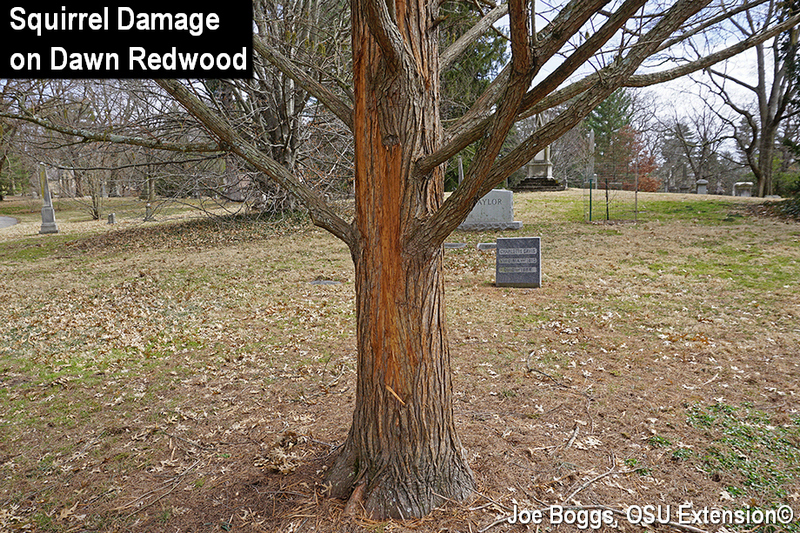 Brian Heinz (Horticulturist, Spring Grove Cemetery and Arboretum) recently sent me pictures showing a dawn redwood (Metasequoia glyptostroboides) with the bark on the main stem stripped in patches. The damage extended from a few feet above the ground to around 20 – 25' up the tree. The bark-stripping damage was most likely caused by eastern gray squirrels (Sciurus carolinensis). Had the debarking occurred elsewhere in the U.S., the culprit could have been the North American porcupine (Erethizon dorsatum). However, it would be highly unlikely to find this fascinating prickly animal in southwest Ohio. Squirrels can injure trees in two ways: by stripping bark and lopping off twig tips. The twig pruning most often occurs in the fall and causes no real damage. It may actually increase canopy density. However, destructive debarking by squirrels can potentially girdle trees. In fact, gray squirrels are considered a major non-native pest in the United Kingdom (UK) where they've changed their name to grey squirrels. Eastern grays aren’t the only squirrels that strip bark. The peculiar behavior has been observed in North America with fox squirrels (S. niger) as well as two so-called pine squirrels; the red squirrel (Tamiasciurus hudsonicus) and Douglas pine squirrel (T. douglasii). Gray squirrels are reported to strip bark on a wide range of deciduous trees. However, I've only observed damage to American beech, honeylocust, and maples in Greater Cincinnati. Although bark stripping has been reported elsewhere to occur throughout the growing season, most of the damage occurs in our region from March through early July. I visited the dawn redwood tree on Monday and it was the first time I've ever observed bark stripping on this species. The pattern was slightly different compared to what I've seen on other tree victims perhaps owing to the dense, fibrous redwood bark. In fact, almost all of the bark on the main stem appeared to be roughened by the squirrels possibly owing to failed attempts to use their claws to prize the bark from the tree. Thankfully, tree debarking by squirrels remains somewhat rare in North America. This is not the case in the UK. Eastern gray squirrels were introduced to various areas in the UK from the late 1880s through the 1920s. They are now wreaking havoc throughout the UK producing widespread severe debarking of woodland and landscape trees and threatening biodiversity; gray squirrels have caused regional extinctions of their native red squirrel (S. vulgaris). A measure of the extent of the concern can be seen by visiting the "UK Squirrel Accord" website (see More Information below). The site notes, "The UK Squirrel Accord consists of 32 leading woodland, timber industry and conservation organisations [sic] in the UK. It was created at the invitation of HRH Prince Charles – who had the aim of bringing a concerted and coordinated approach to securing the future of our red squirrels and woodlands, and to controlling the introduced grey squirrel." Pretty serious stuff. Reasons posited on both sides of the Atlantic for the odd bark-stripping behavior has ranged from reasonable hypotheses such as feeding on the sugar-rich phloem, searching for a water source, gnawing on trees to wear down ever-growing incisors, to the bizarre such as pregnant female squirrels gnawing bark in response to their pain. Another possible explanation was provided in a paper titled, “A novel causal mechanism for grey squirrel bark stripping: The Calcium Hypothesis,” that was published by a group of UK scientists in February 2016 (see “More Information” below to access the entire paper). The authors did a literature review and then synthesized their findings to develop the hypothesis. Citing past research, they noted it is well documented that gray squirrels will gnaw on calcium-rich sources such as bones, antlers, and even limestone. They also found that debarking is most common after a good mast year supports an elevated population of juvenile squirrels in need of calcium to build bone as well as post-pregnant females in need of replacing lost calcium during pregnancy and nursing. Finally, they linked the need for calcium by squirrels to the elevated levels of available calcium in tree phloem in the spring to early summer. The authors state, "Calcium can increase in the phloem by as much as 40% in trees in Spring and Summer after Winter dormancy, as it is required for growth." Of course, science remains in constant motion. In June 2017, the same authors published, "Regulation of bone mineral density in the grey squirrel, Sciurus carolinensis: Bioavailability of calcium oxalate, and implications for bark stripping" (see “More Information” below to access the entire paper). Their second paper seems to refute their earlier Calcium Hypothesis which is science at its best! The long and short of it is the researchers found no differences in femur length between squirrels fed three diets: a diet with CaOx; a diet with low-Ca; and a control group fed a diet with calcium carbonate (CaCO3) which is a form of Ca known to be readily utilized by animals to build bone. More telling, the total Bone Mineral Density (BMD), which is a measure of Ca incorporated into the bone, was higher in the squirrels fed the control diet compared to those fed the CaOx diet, but there was no difference in BMD between those fed the CaOx diet and those on the low-Ca diet. Based on their results, it would seem that squirrels may not be stripping bark to acquire Ca since they are not able to use the form of Ca in the phloem to build bone. Of course, the authors also recognized the shortcomings of their research methodology. Along with the small sample size, they only assessed 10 males and 8 females. They also only had one sub-adult. An important part of the Calcium Hypothesis is that the bark-stripping behavior is associated with juvenile squirrels in need of Ca for bone growth or females trying to acquire Ca for enriching milk fed to their offspring. I've provided a very short overview of these papers. However, the authors were clear that more research must be done to truly pin down the reason(s) for the odd bark-stripping behavior by grey squirrels in the UK (and gray squirrels in the U.S.). Sometimes we become frustrated with hearing, “more research is needed;” however, more times than not, that is the truth of the matter. It gets us closer to the bone.